Dubai, United Arab Emirates, 22 December, 2018: World’s leading professional hair styling brand ghd, unveils the revolutionary ghd platinum+ styler with an event at the Blowout and Go Training Center in Dubai Investment Park. The event attended by Dubai’s finest hair salons featured live demonstrations and a masterclass of styling different hair types and textures by ghd Asia’s head of education, Robert Resnick. The ghd platinum+ styler features Infinity sensors that monitor the heat 250 times per second, to always maintain the safer-for-hair temperate of 185°C. Giving you ultimate results and 70% stronger*, 20% shinier** and visibly healthier hair with twice the colour radiance. The ultra-zone with predictive technology is the latest breakthrough in heat styling which guarantees homogeneous heat on the hair, allowing consistent beautiful results in one stroke. The temperature is monitored 250 times per second so that it’s constantly at the optimum styling temperature of 185°C for ultimate long lasting results without compromising the health of the hair. It personalizes the heat with its predictive technology which recognises the thickness of your hair and the speed at which you are styling and adjusts accordingly - so you get unbeatable results quicker and personalised to you! Robert Resnick – ghd Asia Head of Education for ghd at the launch event said, “We are extremely excited to launch the feature-rich ghd platinum+ hair styler in the UAE. The Middle Eastern audiences have always inspired us to come up with innovative products that suit different hair textures and types. From waves to curls, to flicks to poker-straight hair, one can create a look that’s stylish and effortless”. He continued, “In time with the festive season, ghd platinum+ will ensure one looks her best for all the upcoming season celebrations and is able to achieve a picture-perfect look”. The ghd platinum+ styler comes with an automatic sleep mode after 30 minutes of non-use and a 2.7m professional-length cable giving you extra flexibility to style wherever you may be. The ghd platinum+ styler features universal voltage to deliver outstanding performance wherever you are in the world and comes with a three-year warranty. Whether it's a gift for yourself or someone you love, the ghd healthier styling gift set is perfect for those whose hair is their crowning glory. 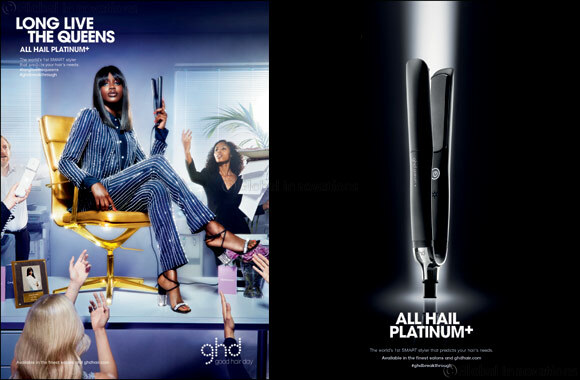 ghd platinum+ debuts in the UAE in December and will be available through the finest Hair Salons in the UAE.